Welcome to Issue 19 of SHAPE Journal. 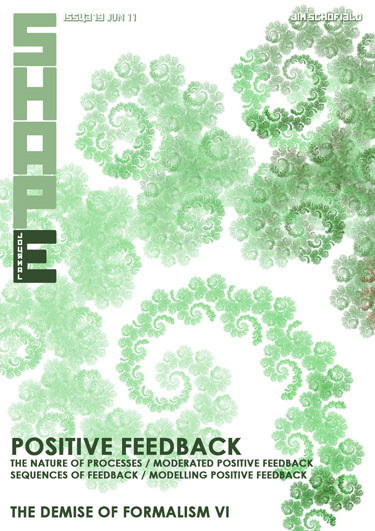 In this issue of SHAPE Journal we carry on with the next installment of The Demise of Formalism. A significant part of this part of the paper addresses the essential change of standpoint that is necessary when tackling Emergent Change, from the usual formal and pluralist approach to a dramatically different holisitic one! Also in this edition we are trying out a very different structure to a standard issue of the Journal. Not, I must hasten to add, in the Design or in the Content of SHAPE, but both in the quantity that we publish in a single issue, and in the intrinsic relationships between the set of papers included. In the past we have divided all of the longer papers into a series of installments, which were then spread over a series of issues episodically - and we usually only had three unrelated topics in each issue. The success of the Special Issues of SHAPE has demonstrated to us that that choice was mistaken, and complaints have made it clear that more coherence and continuity would be acheived by publishing related sets of papers within a given issue. So, for a few issues at least (and maybe for much longer) we will be changing our policy. First, the issues will be larger in size. The articles will be longer than the original 1000 word limit, there will be more of them, and they will tend to be all upon a related or even on an identical topic. In this issue, therefore, will be seven separate contributions, thus raising the content well above the usual limit, though in this first tryout we have chosen fairly short papers with more diagrams. Most of these were written at different times starting 4 years ago, and it is interesting that the very act of composing this latest version has catapulted the editor into another bout of writing on the same topic. Clearly, it is hoped that this format will reveal something of the actual development of the ideas involved, and may even elicit more contributory responses from our readers. This current set is on Positive Feedback scenarios, which turned out to be an absolutely crucial concept on the creation of the Theory of Emergences and in radically transforming in the research into the Origin of Life on Earth. Also, it is perhaps a good time to mention again a series of papers, which will commence in Issue 20, addressing the overall topic of Diagrams of Emergence, and shows some of the series of images that were developed to explain Emergences leading up to the recent Special. So, as a precursor, these have started to be put up on our Blog. Also on the Blog is a new paper on the Nature of Mathematics entitled Shadowland, which compares this symbolic and formal approach with the achievements of the Shadow Puppet Theatres of the Orient.